The task of leading the largest coalition of civil society organizations in South Korea in advancing the lofty goal of Korean reunification may feel daunting to most people. However, Inteck Seo is a South Korean who has taken up the tremendous responsibility and commitment with profound clarity and optimism. In 2012, he led the establishment of Action for Korea United (AKU), a coalition comprised of more than 900 civic organizations across ten cities and provinces in South Korea, and as Co-Chair, has promoted the vital role of Korean civil society in advancing the peaceful reunification of the two Koreas. 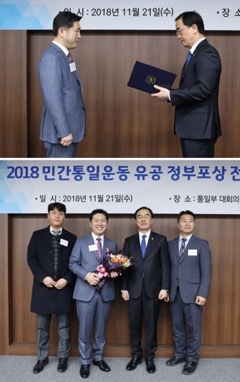 On November 21, 2018, Mr. Seo received the Presidential Commendation for his service to the national movement for reunification. The Ministry of Unification awards a civilian every year to acknowledge their contribution to reunification and to encourage the expansion of reunification efforts. The Ministry of Unification selects the winners based on efforts towards national reconciliation, promoting unification policies, and human rights activities. This prestigious award is public recognition for AKU’s outstanding national contributions to the reunification movement. Over the past six years, AKU has inspired individuals across the political spectrum, leaders from various faith traditions, organizations from many sectors of society, and young people to be active participants in the movement for reunification. One of AKU’s proudest achievements that had far-reaching effects was the initiation of a unification song campaign in 2015. AKU recognized the significance of building consensus for reunification within the general population and utilized pop culture to reach a wider audience. 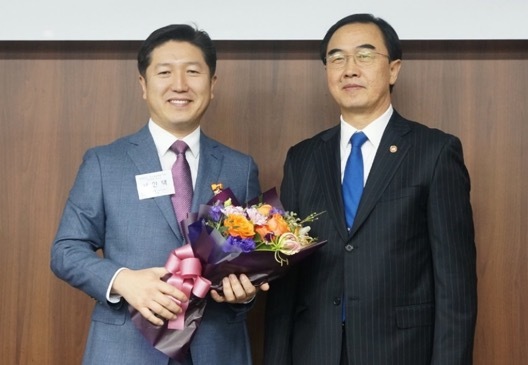 The renowned Korean producer Hyung-seok Kim composed and recorded the heartfelt song One Dream One Korea with 25 of Korea’s top pop singers, leaders of the top political parties, and the Minister of Unification. The culmination of the campaign was the One Korea concert which attracted 40,000 young people to the Seoul World Cup Stadium. AKU continues to draw support in Korea and across the globe through its One Korea Global Campaign. The driving force of AKU and what distinguishes it within the broader reunification movement is the articulation of a unique vison for a free, unified Korea, which Mr. Seo has continuously emphasized over the years. AKU has brought to life Korea’s founding ideal to broadly benefit humanity by envisioning a peaceful, unified nation of virtuous citizens and good governance that helps all to live in dignity and prosperity, and in turn, spread peace to the world. This vision has brought a new level of optimism and enthusiasm to the reunification movement. Besides his role in Action for Korea United, Mr. Inteck Seo also serves as the President of Global Peace Foundation Korea. Sign up for monthly newsletters for the latest on Korean reunification from Global Peace Foundation.